Hi all! I am back with Card 7 in my Holiday Card Series! For today's card, I am using the adorable Christmas Pageant stamp set from Neat and Tangled! These are such cute kids! I love them so much! 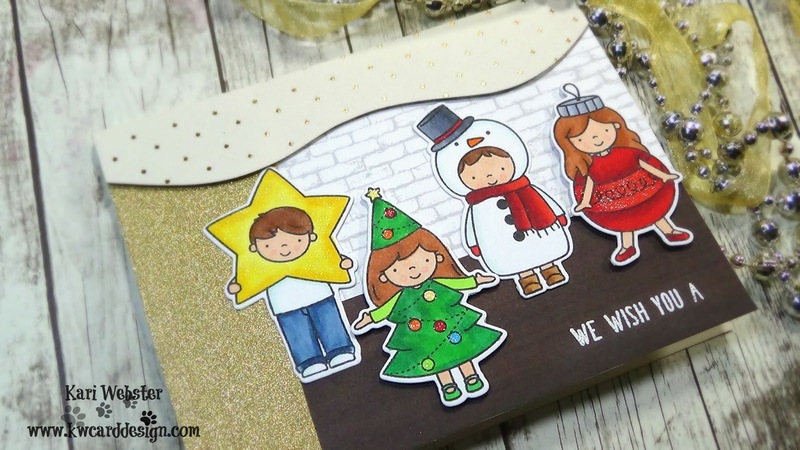 I started this card by stamping and coloring in these cute kids with Copic Makers. All the colors I used I listed below! There's a lot!! Once I was done coloring them, I used the dies that coordinate to cut them out!! I just love coordinating dies!! Makes my crafty life simpler. I wanted to create a scene that these kids were actually on a stage. I found some different pattern papers in my collection that I thought would do the trick! I also used the In the Meadow die set from Papertrey Ink to create a curtain a valance!! After adding the kids to the scene, I added some Wink of Stella to the Star, ornaments on the tree, and the bigger ornament to give extra shine!! This card was a fun one to put together!! All supplies are listed below as well as the video tutorial! I'll be back with Card 8 very soon!! Hi Friends!! I hope you had a nice week!! I am sharing with you Card #6 in my Holiday Card Series. I wanted to use this big scripty Merry Christmas from Simon Says Stamp. 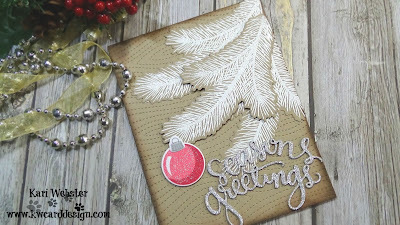 I also wanted to do one of my favorite techniques, embossed resist. I started my card by prepping my white card stock with my anti static powder tool, and stamped the Merry Christmas with Versa Mark ink, and then coated the sentiment with Hero Arts Brass Embossing Powder. I used my heat tool to set the powder and until melted. I wanted to add a bit more around my sentiment, so I stamped, colored and die cut the holly cluster from the Christmas Foliage set from Right at Home, and popped it up with foam adhesive. I matted my inked piece of with piece of patterned paper from the Snow and Cocoa 6x6 pad, and die cut it with a Scallop Rectangle frame from Lawn Fawn. Once I added my entire panel to my card base, I added some Nuvo Crystal Drops to my berries, and some Star Dust Stickles to the leaves for extra shine. If you are interested in the video - it is below with the supplies I used! Thanks for stopping by!! I'll be back with Card 7 soon! Hi Friends! I am sharing today with you Card #5 in my HCS - I know, I have skipped Cards 2-4, but you can easily see those cards and their videos by visiting my Youtube Channel here. And, frankly I've forgotten to write up a blog post for those cards as well, and I wanted to catch up quickly, so I though this would be the quickest way. 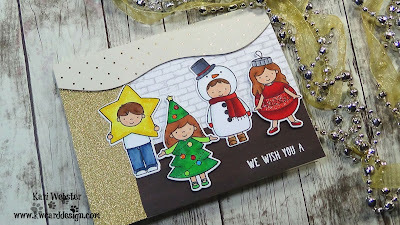 Today's card showcases the popular Holiday Style set from Sunny Studio released last year. I wanted to get it back out today since I didn't get to use it much last year and it is just a fantastic set!! I also love the look of Kraft and white! Such a classic look! 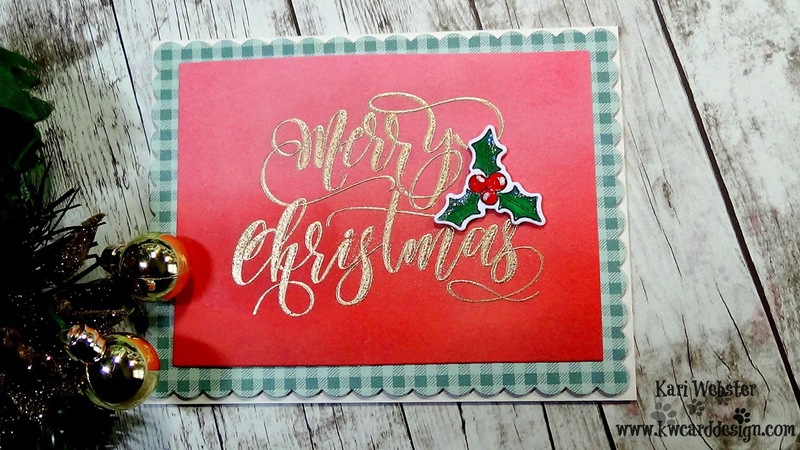 And, I love the added pop of color with the red ornament! 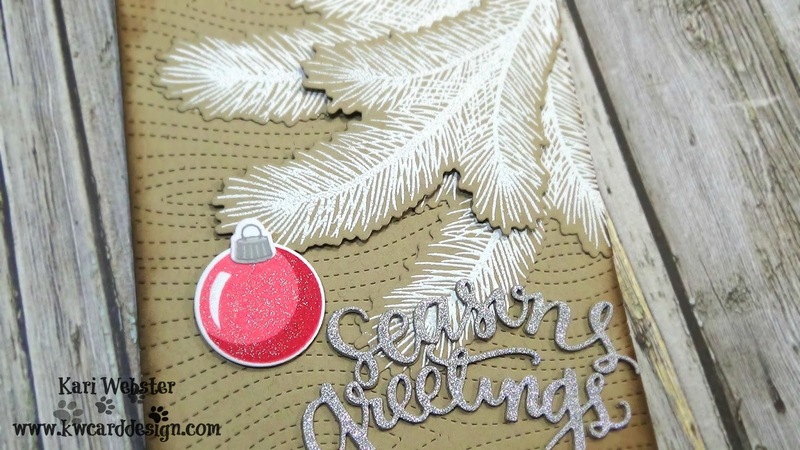 This ornament is so easy to stamp! I know some have a hard time with layered stamping, but this set is a very easy one to line up! 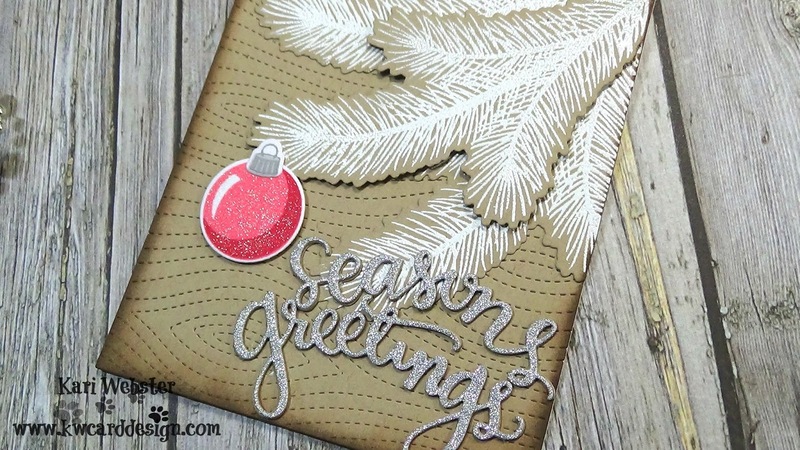 I heat embossed the white branches with white pigment ink from Simon and white embossing powder from Hero Arts. And, then I used the coordinating die to die cut them out. On the background, I used the Lawn Fawn Stitched Wood Grain die to give some extra texture. I thought the edges of my Kraft card stock panel could use "something" so I took a sponge dauber and inked all around with Walnut ink from Lawn Fawn and that really gave it that finished look. For the ornament I used the Floral ink cube set from Altnew and I used the Coral Berry and Ruby Red to stamp the layered images of the ornament. For the sentiment I used the Season's Greetings die from Simon, and die cut some kraft and silver sparkle card stock and stacked them one on top of another to create a dimensional layered sentiment and it really helps for it to pop off of the kraft. I have both the video and the supply list below. Thanks for stopping by today, and I will be back soon with Card #6! Hi friends! I am starting my Holiday Card Series for 2017 and wanted to share my first card with you. I am using the Reindeer Roll Call stamp set from Newton's Nook. I think this set is a great one for doing quick cards for the holidays when you need them. I started out by die cutting a piece of white card stock with the Mama Elephant Grid Die - this is one of my favorites recently. Then, I stamped all three deer images in alternating colors of ink onto each square. 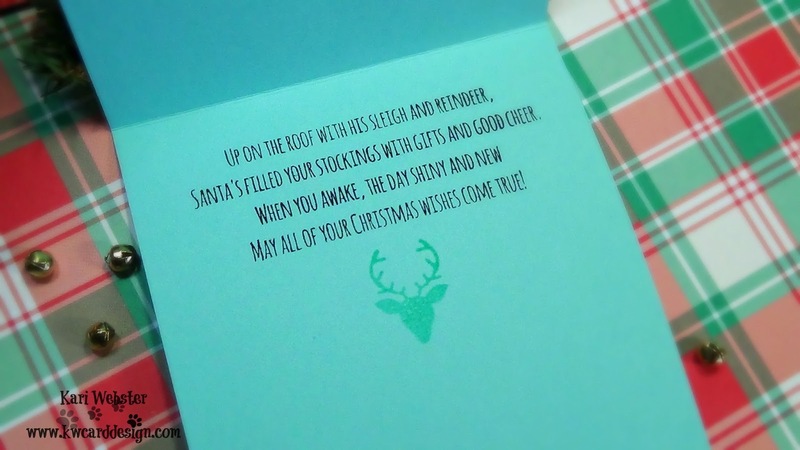 It is a very traditional looking card with these colors. 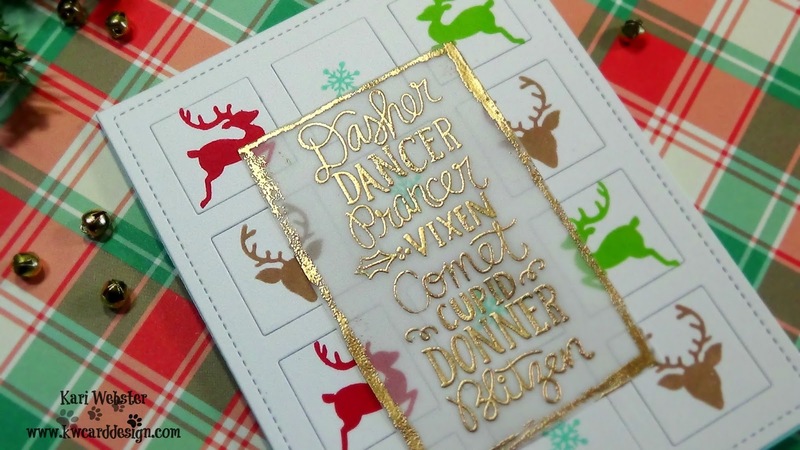 To bump up things, I decided to stamp the main image of the reindeer names in Versa Mark ink and then coated it in my favorite Brass embossing powder from Hero Arts. 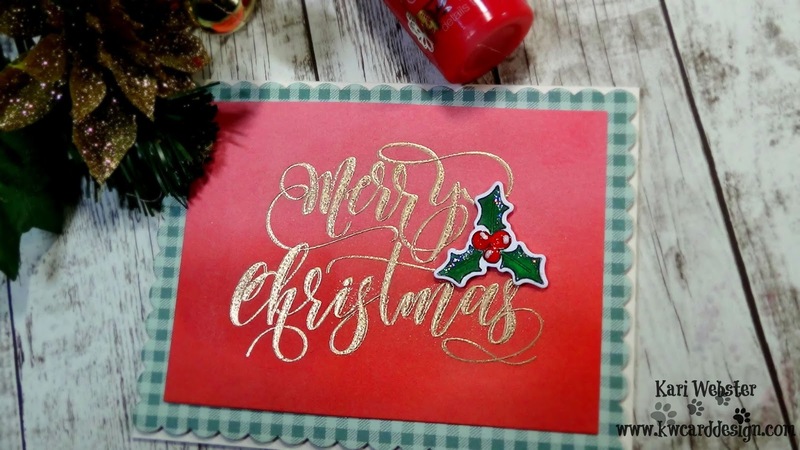 I wanted the edges to have that same look of embossing powder, so I took my Versa MarkER and went along the edges then just dunked the vellum piece into the powder, and heat to set. 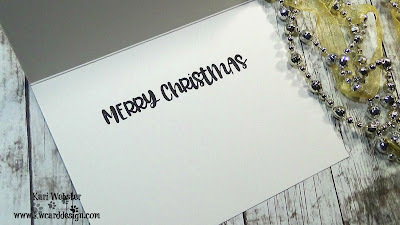 This will serve two purposes - to give that finished look, but to also have a disguise if you will for my adhesive so it won't be visible once adhered to the card. To finish up my card, I stamped a sentiment on the inside (unfortunately this is discontinued). 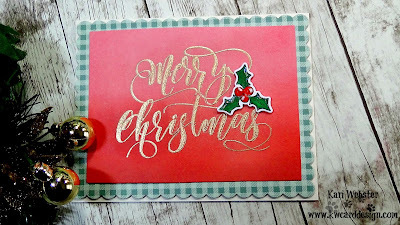 All supplies used are listed/linked below as well as the video tutorial - see you soon for card #2!